We believe that upcycling inspiration lies everywhere. This outstanding envelope art by Toronto-born, Brooklyn-based artist Sarah Nicole Phillips is an absolute testament to that. Have you ever noticed that the insides of envelopes contain various decorative patterns? For Sarah Nicole Phillips this was the inspiration she needed to start creating envelope art. While opening the mail at work, Phillips was struck by the various designs. She decided to start saving the used envelopes as a free art supply. Sarah Nicole Phillips creates stunning collages from discarded office envelopes. Her process begins with sketches that she constantly scribbles into a notebook. Phillips says most of these sketches do not become final pieces. When she does hone into an image that captivates her, she will turn it into a full scale drawing. This drawing then becomes the image template for her work. Phillips keeps boxes full of patterned security envelopes sorted into categories of imagery, colour, tone and size. Once she is content with her selection for an artwork, she dry assembles the collage and then uses adhesive to stick the pieces down. The final step is running the collage through an etching press to ensure the thousands of individual pieces never become unstuck. We love how Sarah Nicole Phillips incorporates the story of these envelopes into the themes of her envelope art. These security envelopes were previously used to camouflage sensitive and private documents. The decorative patterns are not accidental but rather form a scrim to make it impossible to read what is inside the envelopes. Phillips sees the secrets contained within these envelopes as the infrastructure for the bureaucracy of contemporary life. 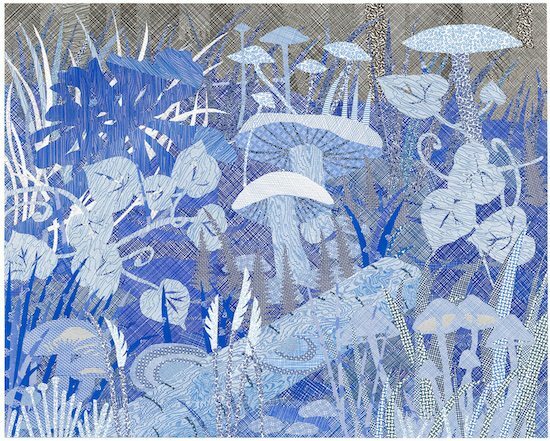 While the matter contained within the envelopes can be quite dull, Phillips turns the patterned designs into fantastical landscapes. In this way the everyday materials of life are transformed into a medium of escape. Some of Phillips envelope art feature benign scenes, such as an expanse of grass. However others, such as those shown above depict the natural environment rejecting it’s current earthy circumstances in exchange for another. The above artwork is titled, “Live Gloriously,” the message conveyed by a body of water pulling itself into the sky as an aqueous rainbow. In the pieces below we see leaves soaring away and trees lifted up by beams of otherworldly light. If you live in Reno, NV you can see Phillips current show, “You’ve Been Selected” displayed at The McKinley Arts and Culture Center. I thank God for all the talent He has given to His children for my enjoyment. Great use of such a mundane object that was made to be otherwise thrown away! I love re-purposing scraps for Art. Top 10 Upcycled Pumpkin Ideas!